Olango, located on an island just offshore from Cebu City in the Philippines, has opened a second ecotourism park, according to the Cebu Sun Star. Mayor Paz Radaza said the program will help the community protect the environment as well as earn income. “This tourism product not only highlights our beautiful spots here in Asinan but also provides income-generating activities for the residents here,” she said. More than 20 families stand to benefit directly from this latest community-based eco-tourism program says Jimmy Glomar, an officer in charge of the project. “The young residents and the women were trained to cook and prepare food for the guests, while the men were trained to tour guests on boats,” he told reporters during the launch last Friday afternoon. One of the unique features of the eco-park, Glomar said, is that guests are encouraged to plant mangroves. “We educated the community about the importance of protecting the environment. We are also closely coordinating with the Department of Environment and Natural Resources to make sure that no environmental law is violated as we go on with the eco-tourism project,” he said. Glomar said the entrance fee is pegged tentatively at 30 cents. Guests can avail themselves of a tour in the mangrove area on board a boat for 65 cents for 30 minutes. Those who want to stay overnight can also rent a camping tent for $2.50 for eight hours. “We are charging low rates because we want locals and foreigners to visit the community and help the residents and the environment,” Glomar said. 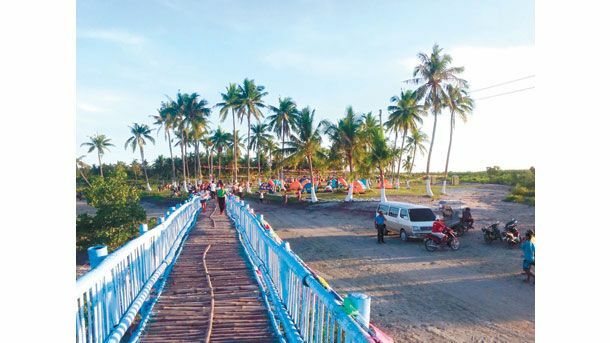 The local government has constructed a bamboo bridge to the site so natives and tourists alike no longer have to wade through the ocean waters at high tide. The park features an aquarium stocked with exotic fish found in the local waters. 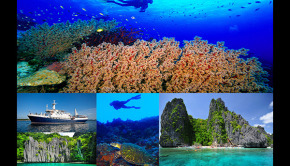 Cebu island is about an hour and 15 minute flight from Manila.